Help Baby Edmund and Family | Kind.Fund: Crowdfunding and fundraising for personal causes and charities. We are committed to your family and will support you in this time of need. Our prayers never cease. Praying for your family and the doctors. Sending all my love and best thoughts! Praying and always here! Love you guys! Baby Edmond, you are loved and have already touched so many lives. We pray for your strength and health. Sending you and your family so much love during such a heavy hearted time. Keep fighting sweet Edmond! Lots of prayers and hugs to the family. Sending lots of love and healing thoughts to this precious baby boy! Edmund James was born very sick at 30 weeks. 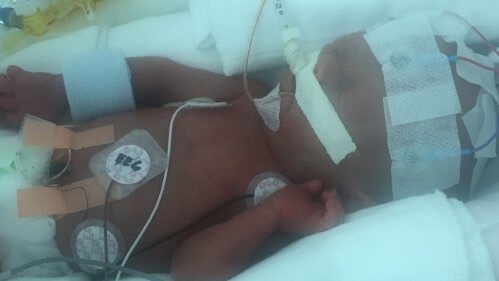 He is currently in the NICU fighting for his life. He has major bleeding in the brain and a few other issues. Mommy and Dad are going to need help with medical expenses, food, etc. as he continues to fight. This could be a very long fight. Everyone’s continued prayers are much appreciated!! !